German carmaker Volkswagen posted record first-half sales thanks to a boost in deliveries to China. Global deliveries were up 5.8% to 3.27 million vehicles, with China taking 531,600 vehicles, an increase of 23.6%. This was the first time VW breached the 500,000 mark in China over six months, and there were also good results in Brazil and central and eastern Europe. 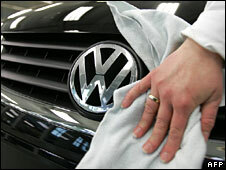 But western European sales were weaker, with a 1.3% rise to 1.84 million vehicles, including 534,000 in Germany. "With our customer-oriented model diversity, and a consequent growth strategy, we were able to grow our global deliveries despite negative influences," Detlef Wittig, Volkswagen's production chief, said in a statement. "We see more storm clouds gathering over the worldwide auto market," he said. "Nonetheless, with the strength of the brand and the model selection, we clearly developed better than the overall market." Earlier this month VW said it had chosen to locate its new US car plant in Tennessee, a move that could pump $1bn (£498m) into the local economy. VW opted for a site in the city of Chattanooga in preference to possible locations in Alabama and Michigan. The euro's rise against the dollar has made it costly to make cars in Europe and export them to the US, leading VW to explore manufacturing again there.